Walking around the Bricktown section of downtown Oklahoma City it’s not hard to see how the area got its name. 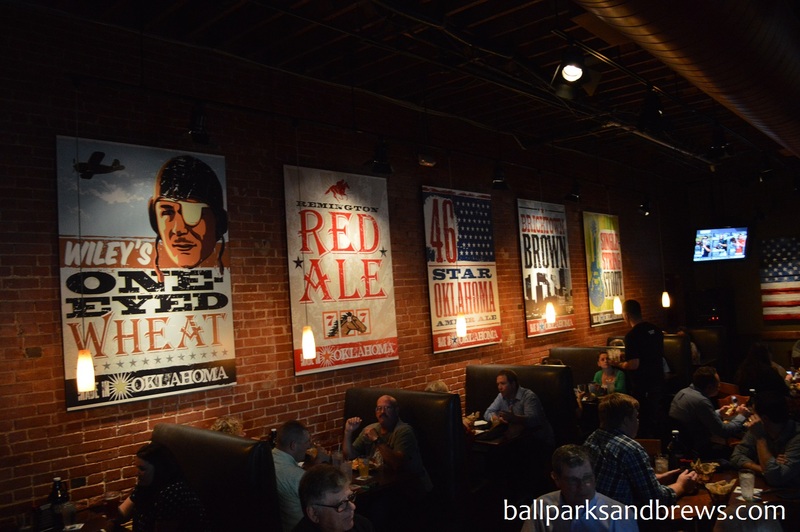 Every building is created from the same red clay brick: the restaurants, the offices, the hotels, and yes, even Chickasaw Bricktown Ballpark. Oklahoma has a surprising amount of baseball history and the ballpark does a great job of illustrating this. There are three statues that surround the park with Hall of Famers Mickey Mantle, Johnny Bench behind home plate and Warren Spahn at the right field entrance. 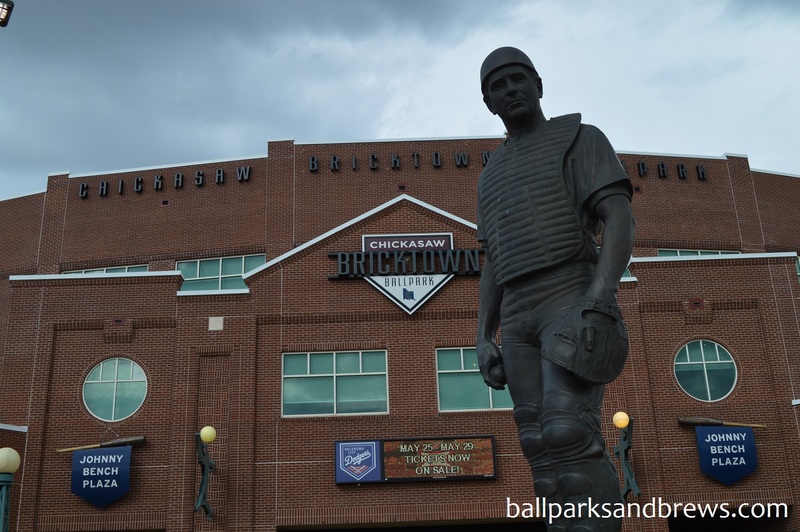 There are also busts from other famous ballplayers from Oklahoma that line the street by the third base entrance. The history lesson continues you enter the ballpark as well. Once inside, there are multiple posters around the concourse that highlight significant moments or players in Oklahoma baseball history. There are multiple locations for groups to enjoy the game. The Budweiser Deck in left field and the Energy Deck in right along with berm seating behind the right field wall. We were there for an early season game and the weather hadn’t quite yet changed. This led to smaller than usual crowd. The upper deck on the first base side was tarped off which makes us think that this was not out of the ordinary which is a shame since this is a beautiful ballpark. Best Spot For Beer: While there is not one best spot, there are Craft Beer carts spread out around the concourse. When we were there, the archaic Oklahoma alcohol laws were still in place (see below) so most carts did not any local options with Kona, Small Town, and Goose Island being the only craft options. Hopefully as the law changes more local options will become available. 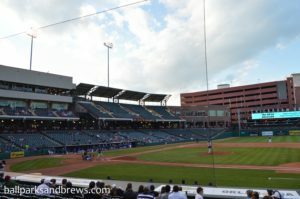 For a ballpark that opened in 1998, Chickasaw Bricktown Ballpark has aged extremely well. 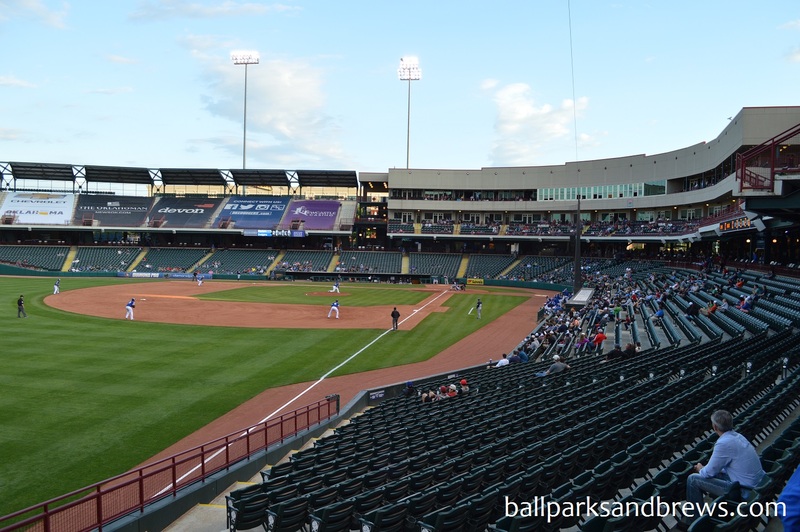 It blends in well with the rest of the neighborhood and has all the amenities you expect with newer ballparks. It is definitely worth the short drive if you are taking in a Texas Rangers game. Brewery Basics: A pioneer in need of a refresh. 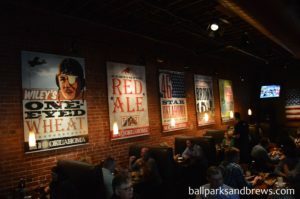 Located quite close to the ballpark, and being the first of it’s kind in OKC, Bricktown was the obvious choice for our pairing. 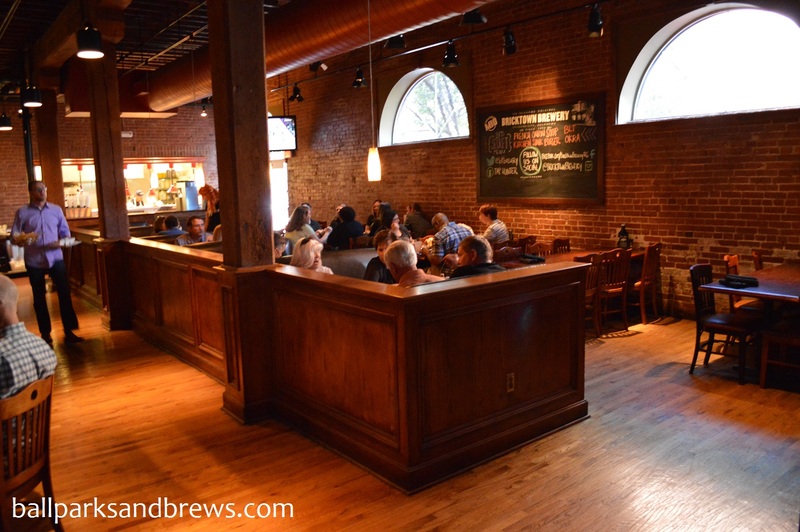 Opened in a large brick warehouse in 1995, Bricktown credits themselves with being the first craft brewery on scene, bringing craft beer into an area that wasn’t sure if they wanted it. We appreciate these original pioneers, but found Bricktown to be struggling with the same issue as many of their contemporaries. 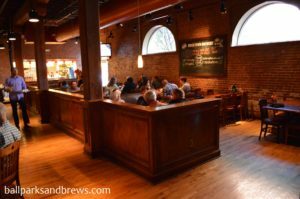 Once pioneers before their time, they are now falling behind relying on traditional recipes and simple, standard offerings while upstarts are changing the craft beer landscape and beer fans are clamoring for the latest -and most creative- blends. 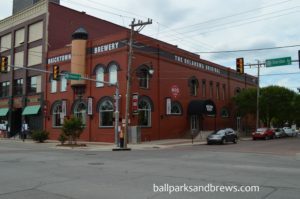 Though they had lots of other breweries on tap (including Prairie, Clown Shoes and Rahr + Sons) we stuck to their home brews in the interest of accurate reporting. It is worth noting that at the time we visited, Oklahoma law prohibited the sale of beers above 4% unless they are sold at room temperature in licensed stores. All beers served outside of these stores must be 3.2%ABV or lower. The only other option is to sell your higher gravity beer to your distributor, who then sells it back to you. It’s also worth noting that at the time we visited there were a few different groups crafting legislation to change these laws, and happily their campaign met with success! OKC law also prohibits the displaying of ABV or IBU, but our server told us they typically shoot to stay right around that 3.0 limit. Old King Kolsch – Light, lemonade color that smells sour and of wet wheat. Light and watery, the palate starts sour, goes earthy and then finishes tart. Though thin, it had lots of flavor for a kolsch, and was similar to a very light, oaky white wine. Blueberry Ale – bright pink like pink grapefruit juice. Also watery/thin like the kolsch with that tangy wheat smell but not as tartly-sour like the kolsch. The recipe blends in 120lbs of Oregon blueberries, but they really don’t come out in the palate until you give the beer a chance to warm up a little. Wiley’s One-Eyed Wheat – Thin yellow color just a shade more yellow than the kolsch. The bouquet is wheaty, but not stinky or tart, but softer with more wheat and a hint of banana and orange peel at the end. 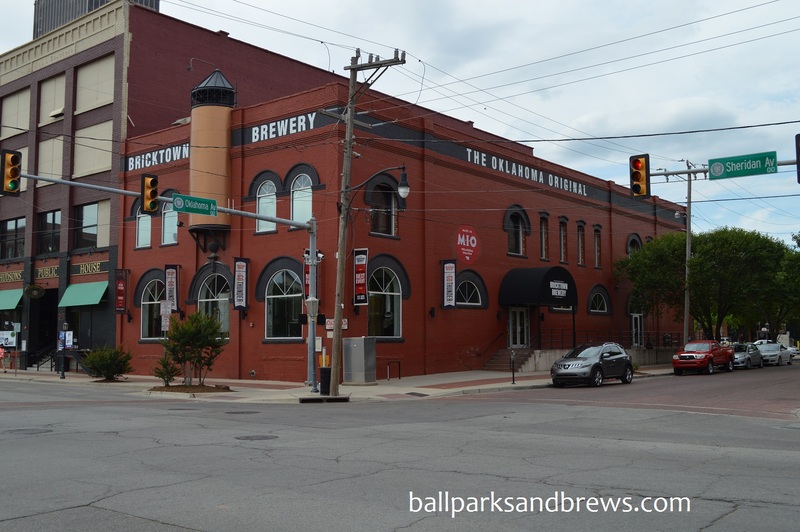 Bricktown Brown – The beer list describes this as a chocolate brown beer, but our sample was more toffee/amber in appearance. Strong caramel notes in aroma and aftertaste that are a bit more subdued as the beer warms. Another thin beer that is malted in the middle and then ends with a bit of a caramel aftertaste. Lots of lacing. Mille McFadden Red Rye – Golden yellow and with noted rye notes, but they weren’t pronounced as is common with the uptick in the popular rye beers right now. The rye does make this ale a bit drier. It starts with the dry-hopped tones, is a tad sweet in the middle and finishes malty. This was a good option, and definitely more flavorful than the first beers in our list. Guardsman IPA – Lots of lacing in this deep golden hued beer. Though you can smell the hops, the flavor doesn’t hold and peters out quickly to a watery, carbonated middle, leaving just a hint of the hoppy bitterness for the end. Single String Stout – Dark chocolate brown color with a deep tan head. It smelled like coffee and was so smooth it was even a little creamy, with a malted, coffee end. Still a tad thinner than we would have liked, but definitely the best beer on the list that day.